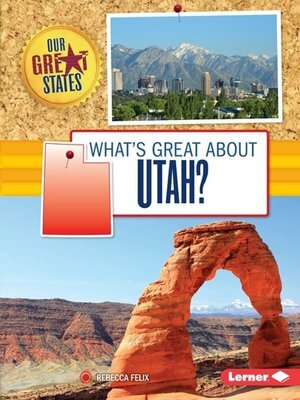 What's so great about Utah? Readers will build skills to identify and summarize the top ten sites to see or things to do in the Beehive State. We'll explore Utah's beautiful parks, vibrant cities, exciting ranches, and fascinating history. The Utah by Map feature helps students locate all the places covered in the book. A special section provides key state details such as the state motto, capital, population, animals, foods, and more. Take a fun-filled tour of all there is to discover in Utah. Rebecca Felix lives in Saint Paul, Minnesota, where she writes and edits children's books. Rebecca has written books on many topics, and learning about new things is Rebecca's favorite part of her job.